Canned reports are the bread and butter of information delivery – I have read that up to 70% of users can be classified as consumers or the type of person that gets a report and is happy with that. There is no desire to analyse additional datasets, examine tweeter sediment or speculate correlation. Consumers just need data/information presented them for their day to day activity in an intuitive and navigation friendly and the report needs to be built for their indented use. 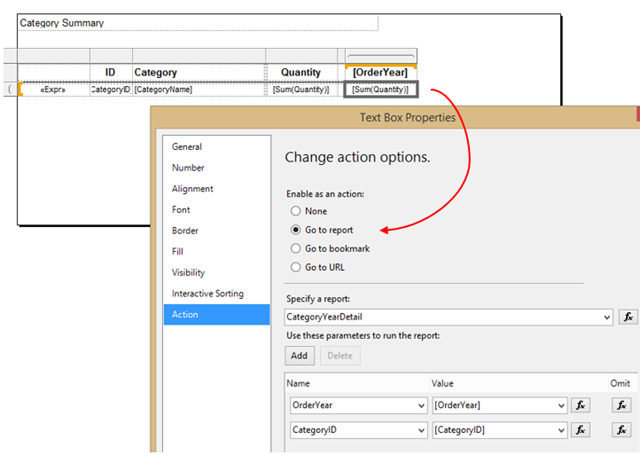 In SSRS, I have found 2 common requirements for features that do not come out of the box and this post looks at 2 snippets to create better reports which enhance the user experience. These are Row Numbers to Grids and the creation of Popup windows. Row numbers help to provide scale. As a simple example, imagine you’ve got a report stating that there are some number of products sold and you provide an action to drill through and see what those products are. If you’ve got a column for row numbers, you can easily reconcile the quantity between the first report and the detail in the second. 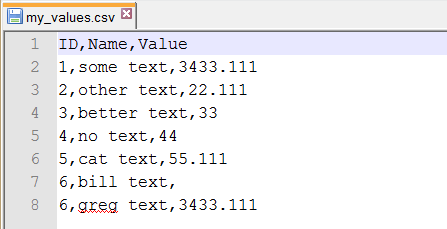 Unfortunately if that detail grouping grain is broken (say for example I use the same data set in a matrix with Category groupings on rows, Year on columns), the RowNumber returns unwanted results showing the last value at the controls grain (as below). Note that there are 36 rows products in the 1st category in 1996. In order to get a incremental value for each row, we need to determine the running value over the distinct elements that we are after (Category in our case). This can be done using the following formula. Using an action is a very flexible way to redirect focus. We can identity coordinates of a cell and then pass those coordinates to another report as parameters. If we reconsider our matrix of Categories on rows and Years on columns, we may want to the user to drill through to a new report that shows the products and their quantities that make up that value. 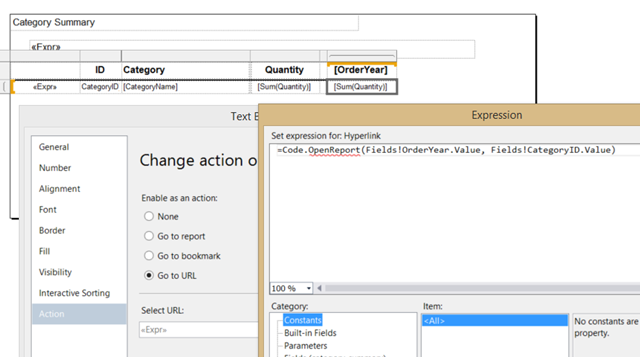 The simplest way to to that is specify the report and assign parameter values as those in the matrix (as below). Now when we click on a cell, a new window will open. There only be one new window regardless of the cell that you click. If you want more control over the pop up window, we can address that in other ways (as below). The windows name is interesting because a window can only have a single name (forget about the target attribute for the window). If we recap on the Category, Year example, the name can be used to define how many windows will open (and the conditions for opening a new window). For example, if our name was simply “Category” the content of popup window would always be replaced (since there is only one ‘Category’ window. However, we could derive a concatenated name of “Category” and [Category ID]. If this were the case, a new window would be created for each new instance of category… (mind you, you’d still have to click on each unique category) however a new window would open for each category. The single report can spawn multiple popup windows. We could take it to a higher level of granularity and include the year (in the name) and have even more windows (potentially) open. Finally, we can also control, the size, position and functionality of the popup window. For example, the following string opens a small window in the top left corner of the screen without menu or toolbars. To my way of thinking its just a data driven information window that we want our users to see.